It was a week. Decisions were made, conversations were had, work was conducted. My week was pretty normal in that aspect. Nothing extraordinary happened. But the week was sprinkled with moments that left me thinking, with a smile on my face, "this is my life." It's kooky. It's random. And it's full of happiness. Am I exactly where I want to be in life? No, not really. Do I have an overwhelming itch to leave Indiana, explore the world, face my fears, enrich my life with exotic people and beautiful landscapes? Absolutely. But for every moment that I look somewhere else, I have five others that leave me happy and contented in a life in the heartland that is truly blessed. I have friends that I can call or text any time and they immediately respond. A bestie that I can send random 90s country lyrics to, and she understands my obsession and shares in the ridiculousness without judgement. She knows me, and that is such a comfort. And I have a "tropical" friend that worries about me because she cares and shows me every day that a big life is filled with following the things that you love and trying things that you never thought possible. I have co-workers that I admire, who inspire me daily. They challenge me and encourage me and support me in all my crazy endeavors. They also don't even blink an eye as we scheme to dress as Disney princesses for our Halloween program. Grown women absolutely giddy about looking ridiculous with a pact that no one will be Belle because Belle is everyone's favorite and that's just not fair. I have a job that lets me play on a daily basis. I get to be an important part of the lives of the teens that walk into my library. I get to make friends and connections with truly amazing human beings. And I get to annoy the heck out of those same teens by playing Newsies every day much to their chagrin. (Sidenote...we're pretty sure, by osmosis, that the boys are learning all the songs. Mission accomplished.) It's a job full of imagination and service that has made me a more compassionate, fierce person. I have a family who I actually like to spend time with. I have parents that love and support me enough to drive a goofy float in a local parade. I have a mother that I want to call daily and a father who enjoys life and isn't afraid to sing loudly at a Grease sing-along with a shower cap on his head. I have brothers that I don't get to see too often, but that I can call for advice or meet for a beer and just relax. They have given me my sense of humor and more amazing memories than I can count. I have a dog that is always happy to see me when I walk in the door and a cat that I'm convinced is plotting to kill me but that can be an awesome napping buddy. Yes, it's a blessed life. It's a life stocked full of dreams and ambitions. It's a life I'm learning to cherish. And it's a life that I firmly believe is made better living in a great country. Looking past politics, it's a country rich with history that can make us stronger and more compassionate if we can just open our hearts, check our egos, and respect our neighbors. I am free to dream and succeed if I allow myself that opportunity, and for that I am thankful. Happy 4th of July! 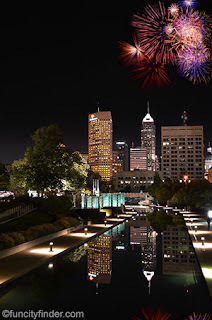 I hope the day finds you surrounded by those you love, looking toward the sky at some great fireworks display...maybe a hotdog in hand (and if the soundtrack is Ray Charles's "America the Beautiful" like in The Sandlot, even better!) And I hope you stop to appreciate the moments that make life great. This is my life, and it's a good one.